The Boise Cascade Home and Land Corporation purchased land that was part of the Kalin Ranches, which was originally used for cattle ranching and irrigated farming. In March 1969, Boise Cascade broke ground and gave life to the 2, 007-acre project. Lake construction began in June 1969. 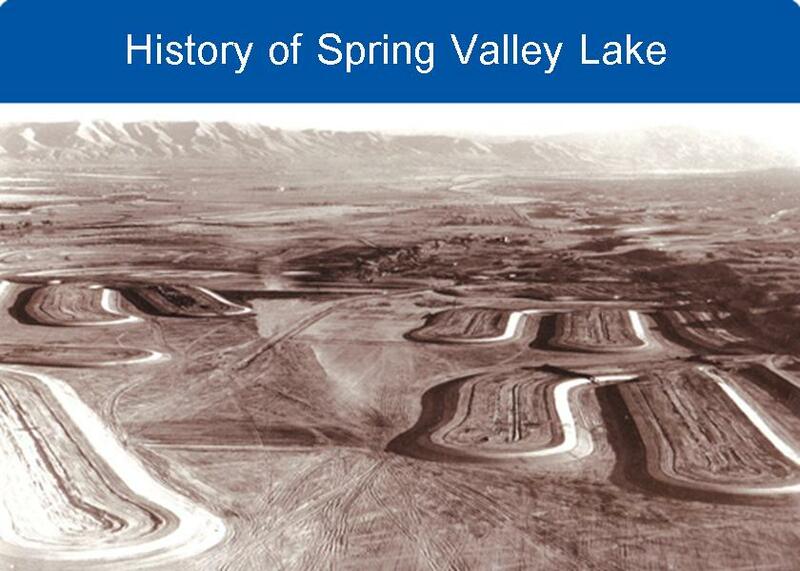 The excavation of the lake basin was one of the largest earth moving projects in the history of the Victor Valley at that time. On January 1, 1970, pumps began to fill the lake with 1,080,000,000 gallons of water. It took slightly over one month for the mile-long lake basin to be filled. The lake consists of 200-surface acres and almost seven miles of shoreline. The shoreline at its maximum length is 6,000 feet long. The depth ranges from 9 feet to 22 feet. The golf course and country club construction began shortly after the lake was finished in early 1970. The Spring Valley Lake golf course is situated on 164 acres and was designed by the world famous golf architect, Robert Trent Jones. The Equestrian Estates is located east of Spring Valley Lake and across the Mojave River. All of the lots are one-half acre and were designed as ranch or country estates where horses could be kept. The first home built on the lake was in February 1973. On January 1, 1975, Boise relinquished the reins of the project's control to the homeowner's association. The State of California incorporated Spring Valley Lake Association in 1973. Most of Spring Valley Lake is governed by San Bernardino County and Spring Valley Lake Association. The Equestrian Estates is located in the Town of Apple Valley and is governed by the Town of Apple Valley and the Association.